I actually got started on Transformers via Beast Wars, then Transformers:Armada, and then eventually got around to seeing G1. However, except for one really bad resurrected-Starscream/Alexis fic that will never see the light of day while I am sane, I have only been interested in writing G1 Transformers stories. Of all the Transformers, the depressed Stunticon Dead End and the unkillable, persistant, terribly flawed yet oddly adorable Starscream grab my interest the most. Of Autobots, Skyfire, because Starscream liked him, and he liked Starscream, and that makes him one very unusual Autobot. [G1] One of Slog's art masterpieces is the Seeker statue known as Stupidity in Blue. This ficlet is based on Wayward Martian's picture titled 'Stupidity in Blue' Go look at the picture, then read. [G1, post-TFTM] Slog, the Decepticon artist, has a new acquisition that he's turning into another art masterpiece; Starscream is dead again, and wants his body back. Now. And Duskwing still hasn't figured out he's dead. One artist, two ghosts, big headache. Revisiting characters from Stupidity in Blue, Redux. [G1] Slightly AU. Circuit Breaker gets captured by Cobra when they steal the Energy Project of the Week just ahead of Megatron, and her only chance of escape involves a long-dead Decepticon named Duskwing. [G1] Wildrider drags Dead End out for some "local Cybertronian culture", aka "drunk & disorderly". In the process, they discover that the Stunticons have acquired a certain reputation, and that some people just don't sympathize with your psychosis. All this, and Duskwing, too. [G1] There are stories Air Force and Navy pilots tell on Halloween and many other dark nights about the ghost jets that fly on moonlit nights, jets no plane can catch, no radar illuminate, no heatseeker track. Here's a few of those tales. [G1] Starscream tosses two human prisoners into an unused berthing compartment. Too bad no one told him just why that compartment is never used. Really too bad that Duskwing is a bit possessive about his old quarters. [G1,post-TFTM] The Decepticon Cartwheel, bartender from Dead and Drunk, chats about bartending with ghosts. Wayward's original painting that started it all. Wayward's illustration for my Duskwing story of the same name. LJ article with low-res photos of Duskwing. [G1] The Stunticons join an outlaw crosscountry road rally, and Dead End kidnaps Spike to be his driver. No, not Sparkplug's son Spike. That other guy named Spike--the one from Sunnydale. [G1] Dead End, Swindle, Ebay. You know there's trouble! [G1] Dead End and an old friend meet at the curb. [G1] Wildrider inflicts more "culture" on Dead End; this time, it's the Arena. Dead End is bored; Wildrider tries to make it more 'interesting'. The Charr Romance - Slash! [G1,post-TFTM] Sequel to 'Bring Flowers'. Dead End returns to Charr. Dead End/Breakdown and you know Starscream is around somewhere. [G1, post-TFTM] Dead End dies. [G1,TFTM] A novella of the Autobot dead who did not go gently into that good night, nor rested quietly while their friends fought so desperately for Autobot City. [G1,TFTM] A short vignette about Starscream's darkest moments, and two guys who have no respect for the angsty dead. [G1,TFTM] An offbeat tale of the death, afterlife, and life of Thundercracker and Skywarp. With flish. 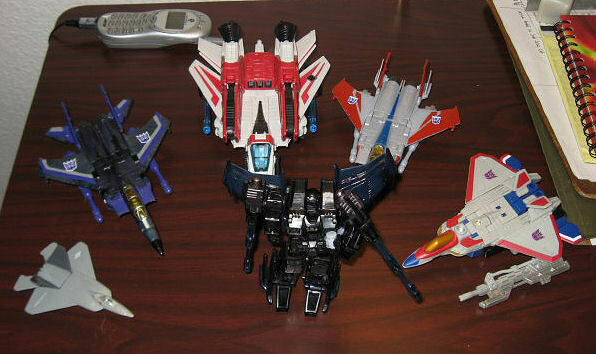 And Starscream gets his two cents in. [G1] Sometimes you need a reminder that some lines should not be crossed... especially if your name is Starscream. Inspired by the fanart "Keeping up with Old Friends" by CHI. [G1] Skyfire's point-of-view regarding the incident described in "Lines". [G1]. A brief character study: what Megatron sees in Starscream. [G1,post-TFTM] Octane's escape from Charr, and a rescue. Octane/Starscream. [G1,post-TFTM] A scene that never made it into "Starscream's Ghost".Slash, Starscream/Octane. [G1, post-TFTM] Skyfire reflects on the friends he's lost to the war... and has an unexpected, uninvited 'guest'. [G1, post-TFTM] Sequel to Friends No Longer with Me. Starscream's unexpected post-mortem reunion with Skyfire leads to conversation between old... friends? [G1, post-TFTM] Skyfire asks Starscream what happened after he was lost in the ice, and learns that erasing Starscream from history is far harder than the Autobot Council of Scientists thought. [G1,post-TFTM] Skyfire does field repairs to Starscream's busted wing and things get a bit out of hand. Follow on to framing sequence in The Message. Slash. Skyfire/Starscream, implied Starscream/Octane. [G1, late S3] What does Skyfire see in Starscream? A brief glimpse into the heart of Skyfire. Set some time after 'Lost and Found' and 'Loss'. [G1, really late S3?] Sometime after the events of "Ghost in the Machine" (and several of my stories as well) Starscream is up in the mountains for some privacy and time to think about where he's been and where he's going... so what's with the remarkably conversational giant wolf? [G1, really late S3] Skyfire & Starscream are surveying star systems for Rodimus Prime-but what do they do when they have to report on the politics and economics of a world that hates and fears intelligent machines? [G1, really late S3] Galvatron created the Decepticon Justice Division and sent them after Decepticon traitors, mutineers and deserters. The DJD is hot on the trail of their number one target: Starscream--but who is hunting whom? [G1, really late S3] Starscream finally takes his revenge on the thing that stole Skyfire from him and ruined his life so long ago--but the price may be too high. [G1] Skywarp learns about the concept of 'Trick-or-Treat' and plans an elaborate, sadistic prank on Starscream for Halloween. It would have worked, too, if not for those meddling Autobots! [G1] The three triple-changer Decepticons are on a mission to an alien star system to retrieve a mysterious energy source. Too bad for them that Decepticons make a nice snack for that which lairs in the deeps of space. [G1] A lot of strange things happened in 2006--how did people not on the scene react to news of various events? A series of short vignettes of well-known characters reacting to events on and off-screen from "Port Call:Cybertron" through "Justice is Served" to "Revelations". Skyfire ponders his place in the world in solitude... and finds he's not alone. His unexpected companion has insights to offer.